Generated power from offshore wind farms is sent back to shore with submarine cables, which emit an electromagnetic field. Sharks are very capable of detecting the signals that surround these cables. If sharks use magnetic-based navigation for migration, then the signals from the submarine cables could act as a roadblock to migration. Before federal land, like that which offshore wind farms will be built on, can be leased, environmental impact statements must be created. These documents will discuss how construction will impact whales or how turbines could impact birds and bats. The impact of offshore wind farms on sharks can’t be ignored and we hope to fill that niche. By funding this project, you are potentially expediting the success of offshore wind farms and protecting the seasonal migrations of coastal sharks. Spreading the word about this project and donating any amount is greatly appreciated, (seriously, 1 dollar will help). 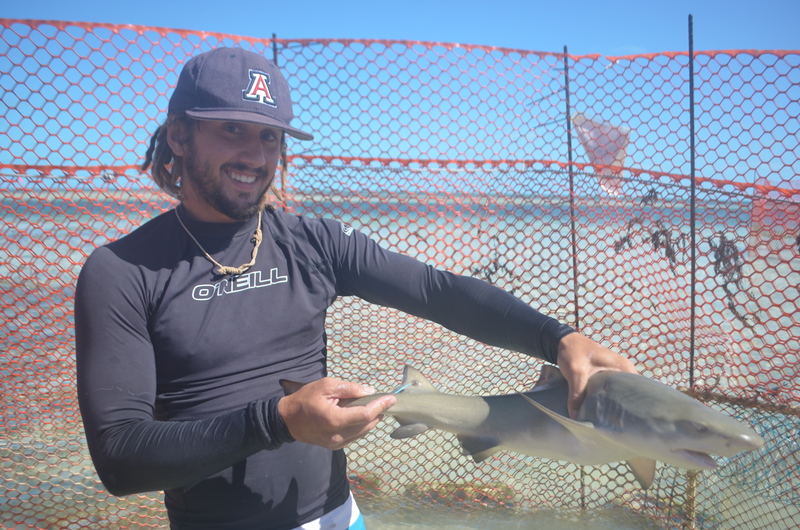 You can adopt and name your own tagged-shark by donating $300, which is the price of one acoustic tag. Our initial funding goal on experiment.com was 10 tags plus expenses, which is $3500. We have almost surpassed our 1st goal, but we still have a long way to go. The project will need about 30 acoustic tags total, but I think we can do it. Even after we surpass our first funding goal, there will still be at least 20 sharks available for adoption. I think it’ll be pretty cool to have a shark swimming up and down from South Carolina to Florida.